On Labor Day 2012, Brooke Thabit launched a dive into the water. What she didn’t know was that the water was only knee deep. Brooke struck bottom and sustained an injury to her spinal cord at the C6 vertebrae, paralyzing her from the neck down. At the time of her accident Brooke was seventeen and a high school senior. She had been dual enrolled in college since 10th grade and completed her first year of college by the start of her senior year in high school. Despite the accident, Brooke completed her high school requirements on time, receiving her diploma with her graduating class in June 2013. Brooke is now enrolled in college working toward her degree. 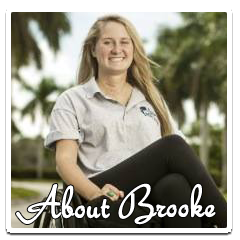 Before her injury Brooke was an avid surfer, surfing as a team rider at a local surf shop and providing community service by teaching Surfers For Autism and The Special Olympics. She is an upbeat person by nature and continues to keep her spirits high and this year she was selected as the ambassador for the “Wings For Life World Run” in Sunrise, Florida to benefit spinal cord injury research. Recovering from a spinal cord injury is not easy or short-term. It takes strong commitment, patience, and money to finance rehabilitation costs, home modifications, medical expenses and equipment. To help with the financial burden of Brooke’s uninsured expenses, a fundraising campaign in her honor has been established with HelpHOPELive, a trusted nonprofit organization that has been providing community-based fundraising guidance to patients and their families for more than 30 years. All donations are tax-deductible, are held by HelpHOPELive in the Southeast Spinal Cord Injury Fund, and are administered by HelpHOPELive for injury-related expenses only. Please consider making a contribution by clicking donate now. On behalf of Brooke and her family and friends, we thank you for your generosity, support and prayers.